It was a brilliant start into the year 2019 for one of EnTri Consulting’s clients: German and Austrian grants have been committed to the Dutch company ACE, manufacturer of intelligent household-energy-systems. 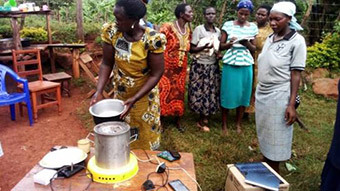 African Clean Energy (ACE) develops and produces smart hybrid biomass-solar energy-systems for households in developing countries. The manufacturing for these thermal-electric systems takes place in ACEs own plant in Lesotho. In early summer of 2018 EnTri Consulting was mandated to identify suitable grant programmes for the extension of ACE‘s activities in Uganda and Cambodia. Following this first step the respective grant applications have been worked out and submitted with EnTri’s support. 1. Austrian Development Agency (ADA) awarded a grant amounting to EUR 200.000,00 within the frame of its commercial partnership programme for ACE’s market extension in Uganda. „It is worth looking across the border not only when it comes to manufacturing or distribution, but also in regard to financing,“ states Klaus Tritscher, Managing Director of EnTri Consulting. Feel free to make use of EnTri Consulting’s expertise!